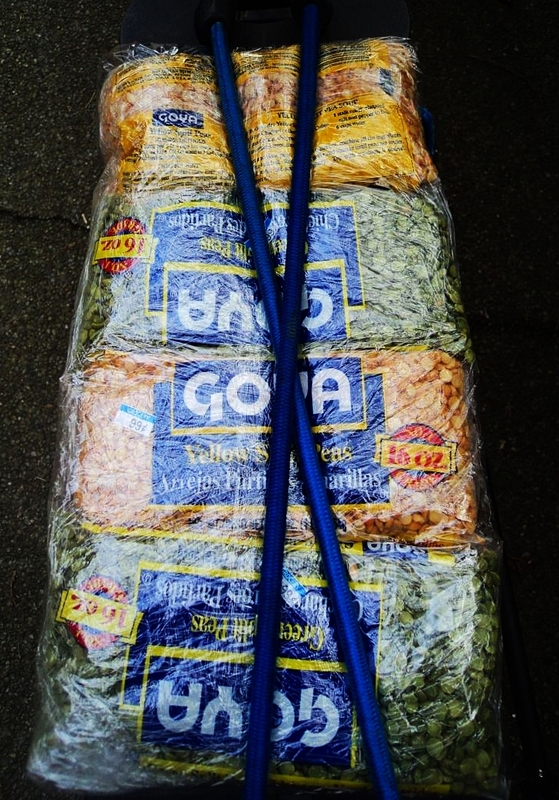 Things on the bike...4lbs/1.8kgs of green and yellow split peas. My minor confession...for the past three days, even though the streets have been snow-free, other than a few small jaunts I have relied mostly on my truck for transport. This is mostly--but not entirely--because of family gatherings outside the city. I also have not had much physical/aerobic exercise in the past few days (and have eaten a lot); I really cannot imagine living a lifestyle like this all the time...riding a bike and getting exercise, for me, is more than just about the physical aspect, it--or lack of it--effects my emotional state as well. I'll be back on track tomorrow. The brief story...as I was loading the split peas on the bike today it reminded me of an incident that occurred just about 20 years ago. I was riding a Raleigh at the time (click here to see it) and was carrying a loose bag of red lentils on the rear rack. At that time in my life, unlike today, I was addicted to speed; no I am not talking about the chemical drug, I am talking about going really fast on a bike. I was flying down Niagara Street on my way to work. I don't know how fast I was going, but likely it was pretty fast. That bike is fast and I would also lean way over the handlebars to be more aerodynamic. Anyway, as I was speeding down Niagara Street a slow moving van decides to make a right turn directly in front of me, forcing me to slam on the brakes...thankfully I had just started wearing a helmet around this time. What happened next was like a slow motion action film, and though it happened 20 years ago I recall it vividly. The rear wheel came off the ground as I slammed on both the front and rear brake. Stupidly, I turned to grab the bag of red lentils (yes, my life was in danger but I was still concerned about spilling the lentils), and as I turned the front tire turned as well...bringing the bike--but not me--to an immediate stop, sort of vaulting me up and over the handlebars. I hit the pavement on my side, knocking the wind out of me (if you've ever had this happen you know how painful and uncomfortable that is). Now here's the interesting part. This happened on a street corner, and I landed in front of a small group of people waiting for a metro bus. And as I lay there clutching my side and gasping for air guess who the first person to ask me if I was OK....it was a young girl, maybe 10 years old. Others did come to my rescue; maybe they were initially in shock of this guy falling directly in front of them. The van never stopped (likely didn't even know what they did)...but I saved the lentils. And this is what I was thinking about as I loaded the split peas on the Mundo today (I pedal much slower and sit upright today). The recipe...this recipe is actually the outcome of two holiday dinners; Thanksgiving and Christmas. The day after Thanksgiving I made this broth utilizing the leftover carcass and then froze most of it. And two days ago, after having ham at our Christmas dinner, I diluted some of the broth with water and re-simmered it with the ham bone for flavor...delicious. 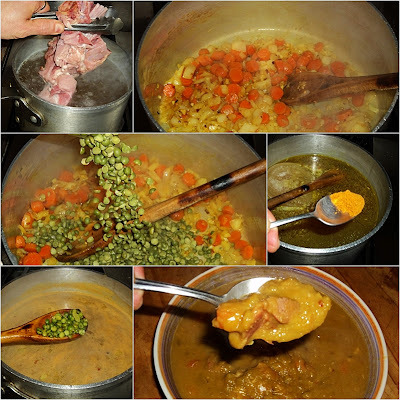 Split pea soup recipes are pretty standard but what's different about this one is how I seasoned it...with a bit of chilies, curry, cumin, fennel, and tandoori spice. The recipe I made today is below. Simmer a ham bone, which still contains a bit of meat on, it in broth or water for an hour or so. Remove the bone and strain the broth; remove any meat from the bone; dice or shred the meat and discard the bone. Heat vegetable oil over medium-high heat in a heavy soup pot, then add a diced onion and carrot (and a stalk of celery if you have it). Cook the vegetables until they begin to brown, then add a couple cloves of minced garlic. Cook it another couple minutes and add whatever seasonings you like (I used chilies, curry, cumin, fennel, and tandoori spice), cook them in the oil for a minute then add split peas, stirring them in the oil and spices. Then add the broth (6-8 cups for every pound of split peas). Bring the liquid to a boil then lower it to a slow simmer. Season it with salt and pepper. Cook the soup slowly for about and hour, or until the peas are thoroughly soft and mashed. Stir the soup often to alleviate scorching. 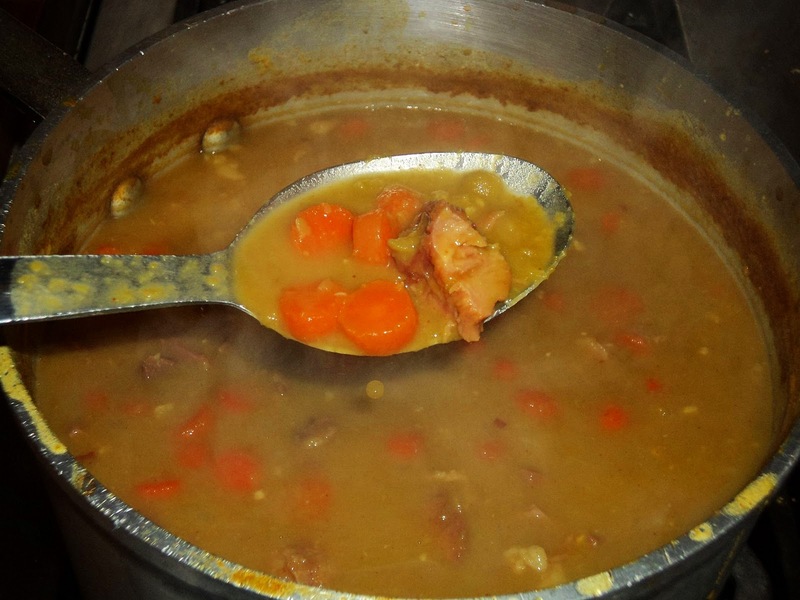 If the soup become too thick, add more broth or water. I like to make mine thick enough that--if I want--I can serve it over steamed rice for a more complete meal. This soup is even more delicious the second day, and leftovers--if there are any--freezes well. If you'd like to see a recipe for 3-bean soup using the same broth, click here. Another great looking recipe. I am taking some time off this week and I think I will definitely give this a go. Our family celebrates Christmas on Christmas Eve, and I have always done a lentil soup with smoked pork and sausage. Such a simple but satisfying meal. Your cycling story reminds me of my fast cycling days (many decades ago) when I crashed at the top of Clifton Hill on my way to work at the Refectory. No real damage to me or the bike but my pride was mortally wounded as the throngs of tourists stared at me. No van to blame, just reckless youthful riding. p.s. the riding is still great here. Thanks Kevin. The cycling is still good here as well. Years ago, when my son was much younger, I rode down Clifton Hill with him on a tandem...quite the experience. Happy new year to you as well.